You are here: Home>Topics>Courthouse Restoration, "Thousandaire"
A fundraising event for the Oughterard courthouse restoration project to safeguard an important building in the town will take place later this month. 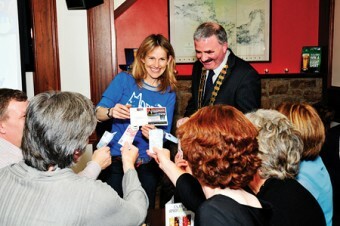 Launched by well-known musician Sharon Shannon, the ‘Who wants to be a Thousandaire’ event will be held in the Oughterard Community Centre on Saturday November 24, and promises to provide a superb night’s entertainment with Ollie Turner of Galway Bay FM taking charge of the proceedings. The proceeds from the event will go towards the massive restoration project planned for the town’s iconic building. The plans for the newly restored courthouse include a functioning venue for the community through which arts, culture and heritage will be promoted. An improved and expanded library service will be provided for the community and the surrounding catchment area. Flexible training rooms and a coffee dock will also be incorporated into the newly renovated building. Tickets for the ‘Thousandaire’ event in November are now on sale at a cost of €10 each. Call 091 552808/087 6163584. The Oughterard Courthouse Restoration Project is striving to safeguard an important building in the local heritage for future generations.